It seems cruel to criticize free theater. I mean, it’s free. All I’m investing in the performance is my time. It’s not like Broadway, where tickets can run $100 a pop. There, if I hate a performance, I can justifiably stomp my feet in anger and shake my fists at the sky, cursing myself for flushing $100 down the toilet. But free? Well, the outdoor performance of The Legend of Sleep Hollow at the Carolina First Amphitheater at Falls Park on the Reedy is so miserably bland, boring and lifeless that I felt like I lost $100. I’m not exaggerating here. Even C-Span is more captivating. It didn’t help that the actors’ accents were so poor and their annunciation so unclear that most of what I heard was garbled mush. Here’s a rule: if everyone in the cast can’t nail a Northeastern accent, no one should do a Northeastern accent. Another rule: don’t step on each other’s lines in an outdoor amphitheater. It’s hard enough to hear you as is. There are no walls to which sound can bounce off of. If you speak over each other, the result is only noise. No one will understand a word. Since this was a production by the Upstate Shakespeare Festival I assumed we’d be dealing with professional grade actors. I mean, it’s the Shakespeare Festival, that’s WAY above community theater grade acting, right? Well, no. 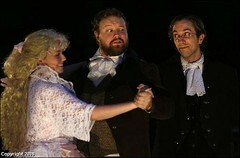 Only one member of the ten-person cast was a member of Equity, the union to which all professional stage actors belong. So what was nice? Several things. The venue is great. The stage and environment are perfect for outdoor theater. The costumes were fun, with the exception of one heinous wig (shown here). The set was simple and sufficient. And the actors all had mics. Too bad we couldn’t understand most of what they were saying.